Shopping for a 2017 Subaru Outback? First go for a spin in the new 2017 Mazda CX-5 at Spinelli Mazda, your Mazda dealer in Lachine! More affordable than its rival (starting at around $25 000 compared to an MSRP of about $30,000 for the 2017 Outback), the CX-5 is an SUV with many qualities and it outclasses the competition on many levels. Here are some of its features! A KODO design that makes all the difference. Like the rest of the Mazda family, the Mazda CX-5 adopted the KODO design language - The Soul of Motion. Sweet, right? It's the perfect blend of sporty and graceful lines; the design of the CX-5 makes it look like it’s ready to pounce. But the KODO language isn't just about offering a pretty package: it continues into the passenger compartment and the quality of finishing details and materials will leave many in the industry jealous...like the 2017 Outback. Depending on the engine you choose, the Mazda CX-5 has a fuel consumption of between 9.4 and 10.2 L/ 100 km in the city, compared to the Outback, which burns 11.0 L/100 km with a similar engine. 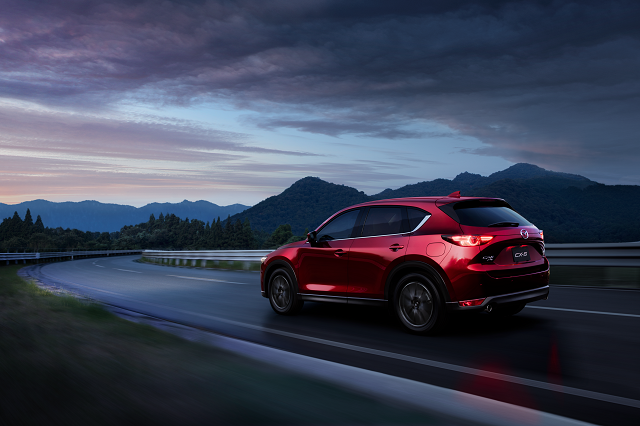 And while we're speaking of engines, the CX-5 offers a 155 horsepower 2.0 L 4-cylinder SKYACTIV or a 2.5 L 4-cylinder that produces 187 horsepower, while the 2.5L 4-cylinder engine of the Outback only offers you 175 horsepower. More than enough technology and other features. Whether it's the MazdaConnect system, navigation, Bose sound system with 10 speakers, air conditioning with pollen filter, push-button starting, electric opening power liftgate and heated front and rear seats, you will find all this equipment in your CX-5- and even more- depending on the model you choose. With so many advantages, why choose the Subaru Outback when you can opt for the CX-5? Come meet us today at Spinelli Mazda and take advantage of our great current Mazda promotions on our in-stock models. Don't forget to ask for details about our various Mazda financing products and choose the one that fits you best! Come in for a visit and take advantage of the best offers in the greater metropolitan region!